The airline industry is complicated. And, thanks to such a rich history, The industry is also great fodder for books. Here are five must-reads for anyone working in travel. For startup founders in travel, the vertical demands a strong foundation of industry expertise to build a business with longevity. The layered dynamics and many sub-sectors make it one of the most complicated industries to navigate partnerships in. This complexity is one of the many reasons it’s hard to successfully build a travel startup. Even within travel, aviation stands alone as an intimidating landscape. Influence of national governments, complicated regulations on route access, heavy manufacturing processes and a wide range of add-on services and ancillaries make for a chaotic business environment to the uninitiated. To ensure the best chance of success with an aviation venture, a functional understanding of the airline industry is crucial. Knowing how it began, how it grew and expanded, and where it is today will help you make informed decisions about your travel business and foster a greater appreciation for the industry as a whole. One good way to educate yourself on the airline business is to participate in business communities such as Voyager HQ, attend more content-focused and networking events, and engage founders and executives directly involved. But if you’re looking to gain some background knowledge and insights from home (or maybe from the plane), the best way is to read and learn from others’ experiences. Finding good books on the airline business is difficult — so we went ahead and did the hard work for you. Here are five of the Voyager HQ team’s favorite books that have helped us appreciate the past and present eminence of the airline industry. This one by Wall Street Journal reporter Thomas Petzinger, Jr is the most comprehensive look at the airline industry from the Wright brothers all the way through to the deregulation of the industry in 1978. 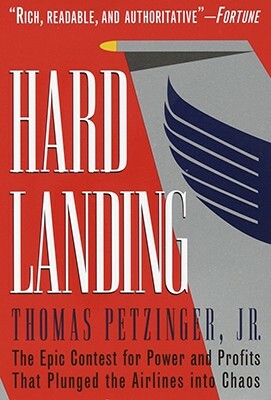 Hard Landing describes in detail how a small group of men struggled for control of the world’s airlines — prominently featuring Robert Crandall of American, Richard Ferris of United, and Frank Borman of Eastern Airlines. A quite dramatic inside look into the history of the airline industry, this one offers a deeper understanding of why the modern aviation industry operates the way it does today. This true story reveals the history of how Herb Kelleher founded and built Southwest Airlines, while simultaneously revolutionizing the airline industry with a relentless focus on both good service and low fares. Thanks to unlimited access to key documents and the people of Southwest Airlines, you get a real inside look on the airline’s ascendent trajectory. The best part of the read is the motivation to implement some of these strategies at your own startup! This incredible story describes JetBlue’s journey from a small airline based in New York City to ultimately becoming a dominant player in aviation is inspiring to entrepreneurs of any industry. This inside look at the company’s unique strategies explains how a small startup airline quickly gained recognition through forward thinking and a relentless focus on product. JetBlue’s unique principles continue to be an inspiration for many startup founders. After the 9/11 terrorist attacks, the global aviation industry tumbled. Demand dried up and airlines struggled. Delta Airlines, in particular, was in shambles — the airline was verging on bankruptcy, and many didn’t believe it would be able to come back. Facing financial trouble, customer distrust, employee apathy, rising fuel prices, and fierce competition, Delta not only survived but thrived. Through extensive research and interviews by Seth Kaplan and Jay Shabat of Airline Weekly, this book offers a blueprint of a comeback driven by resilience, drive, leadership and strategy. As Delta CEO Gerald Grinstein confidently said in 2006, “When the history book is written on the restructuring of this industry, Delta will be the greatest turnaround story in it.”The book has been written — and it’s a useful tool to learn how Delta’s tireless motivation can help you push through your own startup struggles. Skygods tells the dramatic story of the tragic downfall of Pan American World Airways, commonly known as Pan Am. Once one of the most admired and glamorous companies in the world, Pan Am defined the Golden Age of the aviation industry with its global, jet-setting appeal. Author Robert Gandt, a former pilot, uses the perspectives of Pan Am executives and airmen to describe in shocking detail the truth about the company’s corrupt management. After a series of ill-advised financial decisions, the company eventually collapsed — signaling the end of an era in aviation, as well as one of the most successful airlines in the world. Read this story for a hefty dose of nostalgia — and to learn how to avoid similar mistakes in your own business. Check out these books and more on Voyager HQ’s recommended reading list. Have a favorite book about aviation? Leave a response with your suggestion or tweet at us and we’ll add it to the list!